The Metro Station is at only 3 minutes walk from the apartment and the metro goes directly to the Santa Maria Novella train station in 7 minutes. Or if you choose to walk, it is only 15 to 20 minutes nice and easy walk along the Arno River with a stunning view of Florence. There are metered parking spaces (about 14 euro for a day ticket; sunday free) in front of the building and the access to main highways are within 10 minutes drive. I live nearby and available 24/7. Happy to offer recommandations on restaurants, museums, day trips or anything else to make your vacation unique. 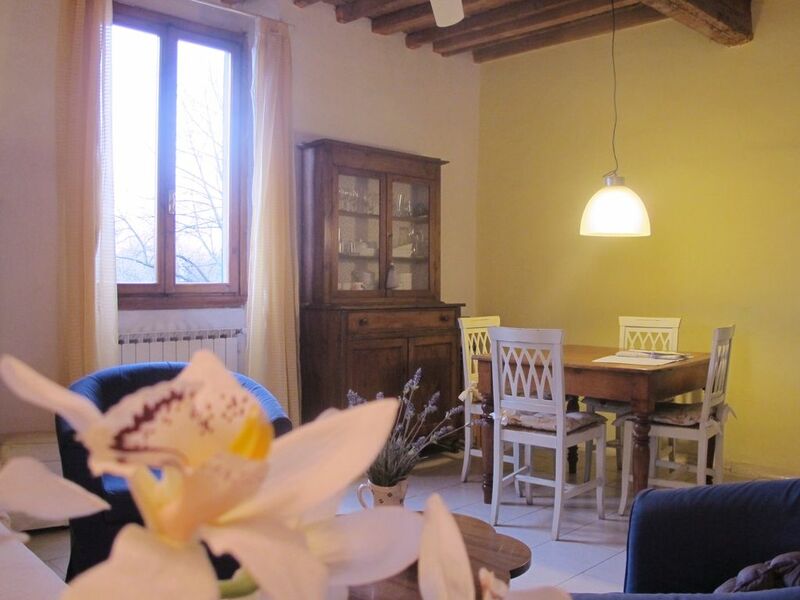 Located by the Arno River (riverfront), this spacious apartment offers a wonderful view of 'Parco delle Cascine,' where most Florentines go every Tuesday for its open market featuring fresh fruits and flowers, local arts and crafts, among other beautiful things. The apartment is at the first floor of an 1800's building. It's very tastefully decorated, fully-equipped, and all rooms are bright and sunny. It's very comfortable with two bedrooms (one with a double bed, one with two single beds), one full bath and one half bath, fully equipped kitchen with everything you will need to cook a delicious Tuscan meal, living room with sofa bed ( sleeps 6 people confortably) and dining room. A cot and high chair are available with no extra cost. Whether you are looking for a romantic getaway or a friends and family special reunion, this apartment offers you an excellent value for money and quality. This is for sure a very typical Florentine, non-touristy rush-rush area!! It is easy to see clothes ranging outside the buildings to dry, old ladies going to the local mart with their grocery baskets, and patient fishermen trying for luck by the Arno River during Sundays. I live nearby and available 24/7. Happy to offer recommandations on restaurants, museums, day trips or anythingelse to make your vacation unique. Riverfront Apartment. The apartment has a lovely view of the Arno river. Paying parking spaces in front of the building and along the street. It is usually easy to find a spot. Cost about 12 euro per day. Cosy living room, with beautiful view of Arno River. Flat TV, stereo, celling fan, double sofa bed. Seats 6 people. Italian and american coffee maker. This apartment is so convenient for sightseeing in Florence. Close to the Metro, buses and walking distance (15-20 minutes) to Pont Vecchio and from there to Uffizi, Duomo and all the major sites. The apartment has two good sized bedrooms with closets, a full bathroom plus half bathroom, well equipped kitchen and washing machine. We enjoyed the living/diningroom and having a TV. Christina, the owner provided lots of information regarding good restaurants, grocery stores, transportation and sightseeing suggestions.